Berlin (AFP) - Angela Merkel's chief of staff on Monday joined the growing chorus of criticism of Arsenal's German midfielder Mesut Ozil for reportedly inviting Turkish President Recep Tayyip Erdogan to his wedding this summer as his witness. 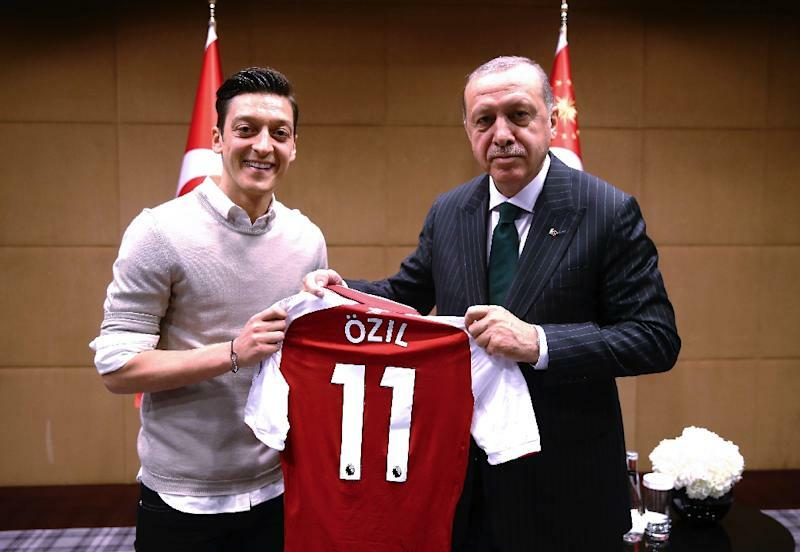 The 30-year-old Ozil, who has Turkish family roots, sparked controversy last May when he was photographed with Erdogan, raising questions about the footballer's loyalty to Germany on the eve of their disastrous World Cup campaign. After 92 appearances for Germany, including a key role in the 2014 World Cup victory, Ozil suddenly quit the national squad last July, accusing German football officials of racism. On Sunday, Germany's top-selling tabloid Bild reported that Ozil, 30, and his model fiancee Amine Gulse, 25, a former Miss Turkey, personally presented Erdogan in Istanbul with an invitation to their wedding this summer, asking the Turkish leader to appear as the footballer's witness. The invite immediately drew sharp criticism in Germany, whose government has been sharply at odds with Ankara over a range of human rights questions in recent years. Helge Braun, a CDU politician and chief of staff to German Chancellor Merkel, told Bild it "makes one sad" that Ozil would make a such a move despite having already been sharply criticised by the German public over his first meeting with Erdogan. "The fact that this has continued will have disappointed a lot of football fans - me too!" said Braun. The politician accepted Ozil's was "a private decison" which one must respect, but appealed to the footballer as a role model, especially for young Turks in Germany. "Footballers are symbolic figures in our society, with whom people identify with much more than ministers," added Braun. "And so the question is raised: how much does someone wearing the German national jersey stand for Germany?" Braun's comments come after German politician Cem Ozdemir, whose parents are Turkish, said on Sunday that he found it "inappropriate" for Ozil to invite the Turkish leader. Ozil -- one of the world's most popular footballers on social media with 31 million followers on his official Facebook account, 19.1 million on Instagram account and 23.9 million on Twitter -- has an obligation as a role model, added Ozdemir. Another lawmaker, Alexander Graf Lambsdorff, was equally unimpressed by his invitation to Erdogan. "The wedding is the private matter of Mesut Ozil, but he is a world star, who people look up to, so of course it's a pity from a political point of view," Lambsdorff told newspaper Welt. The Arsenal midfielder, a third-generation German, whipped up a political storm when he was pictured alongside Erdogan last May. Criticism intensified after the red-faced defending champions crashed out of the first round of the World Cup in Russia. In the wake of the World Cup fiasco, Ozil announced his resignation from the national squad, saying: "I am German when we win, an immigrant when we lose".